Death Valley National Park is one of our favorite places on the planet. 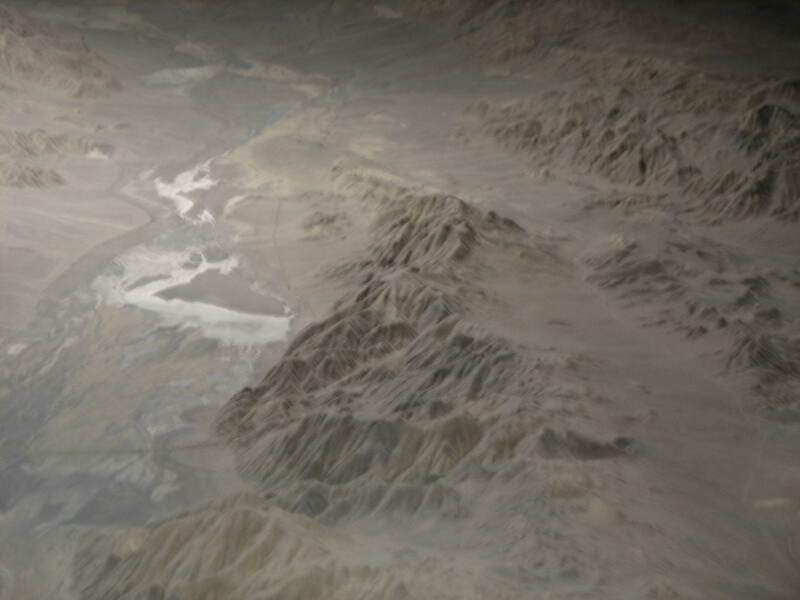 One of the things we like about it is that because it is so isolated, very little changes over time, at least in terms of human impact on the landscape. Except for a much-needed campground upgrade or two (and the disappearance of the date milkshake stand at Furnace Creek, alas), most of the buildings and facilities are pretty much physically the same as they were 20-plus years ago when we first started visiting … including the museum at the Furnace Creek Visitor Center. As far as I can tell, the building has remained essentially the same since it was built in the 1960s (I think), back when this was Death Valley National Monument. 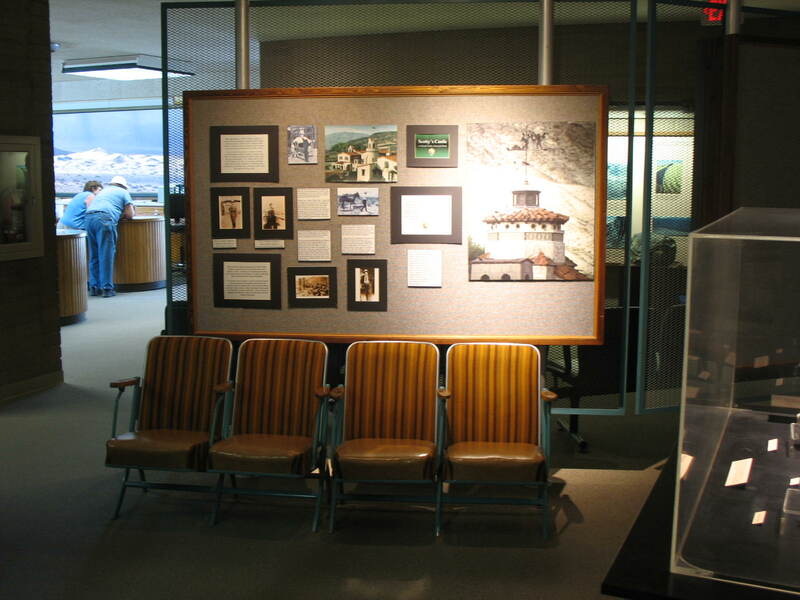 And judging from the exhibits, the museum has not changed either. 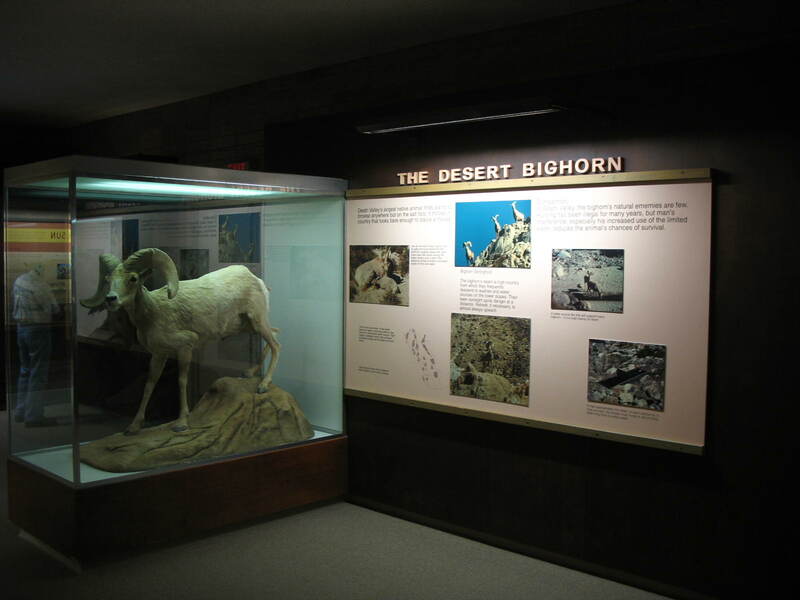 With its static exhibits, photo displays, and stuffed animals, the Death Valley Museum is a time capsule of 1960s museum practice and philosophy. And that’s not necessarily a bad thing. Most of the year, Death Valley is hot and intensely bright. The vistas are long and shade is hard to come by. It can be overwhelming, visually and physically. 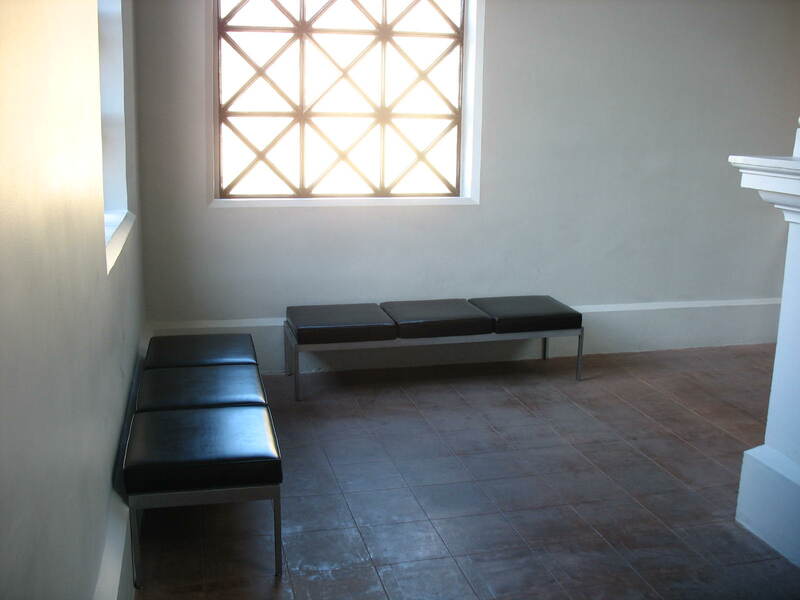 A visit to this quiet, dark, contemplative space provides welcome relief to the senses and the spirit. 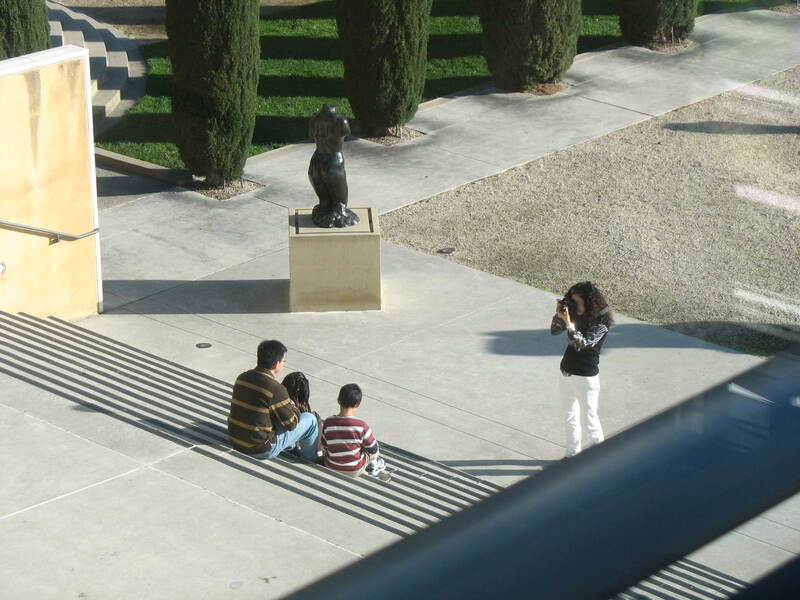 At least in my observation, visitors — kids included — slow down here, lower their voices, and quietly take in the old-fashioned exhibits. 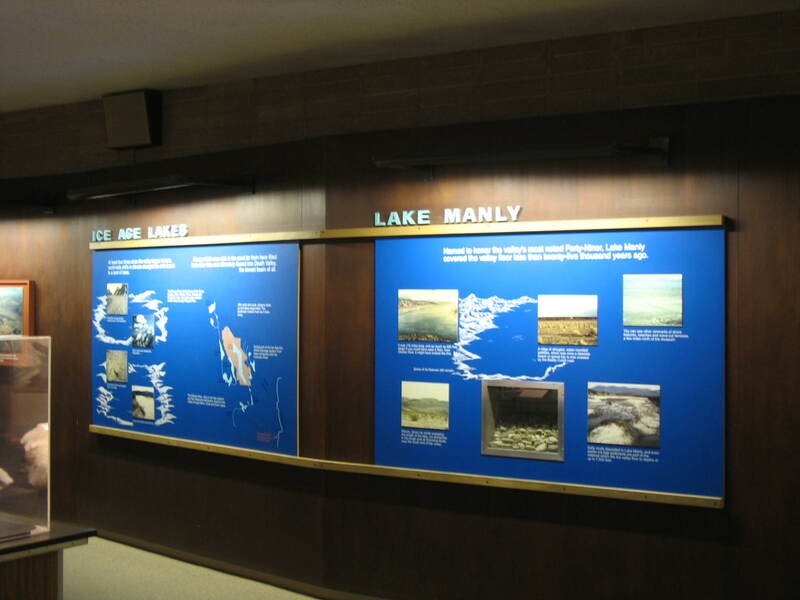 What’s more, the exhibits are well-written and informative. 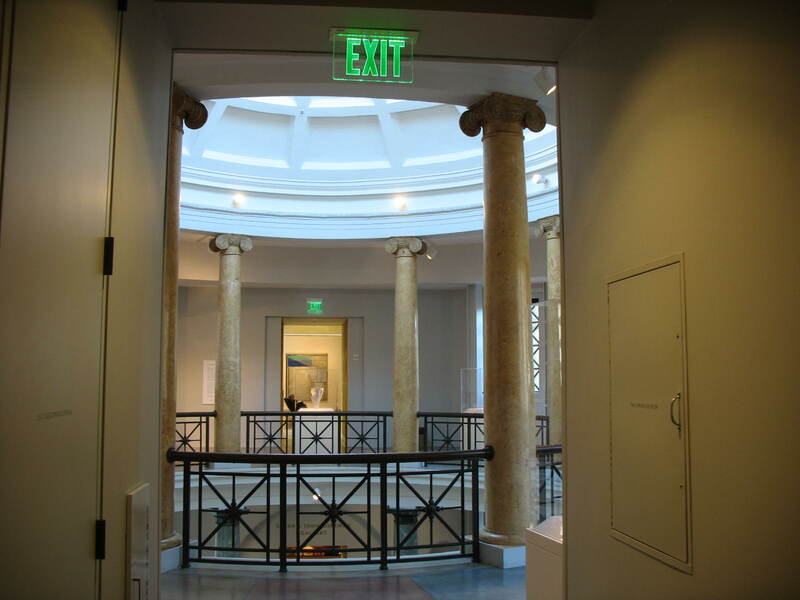 At this point, the museum itself has become an historical artifact in itself — the kind of place a parent can take a child and say, “It was just like this when my parents took me.” I think there’s a great deal of emotional comfort in that continuity, in addition to the physical and psychic comforts of coolness, dimness, and quiet. That’s all on the brink of changing. 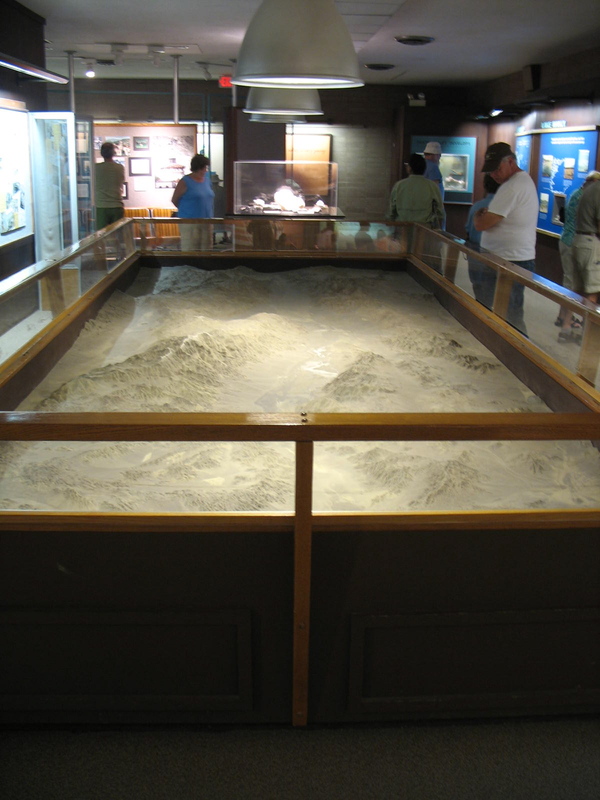 For many years, Death Valley was a total backwater in terms of telephone and computers. There were old-fashioned land lines, and beyond that, nothing, unless you had a satellite phone. But now there’s wi-fi, bringing with it the sight of people slumped against the wall of the Visitor Center working on their laptops. 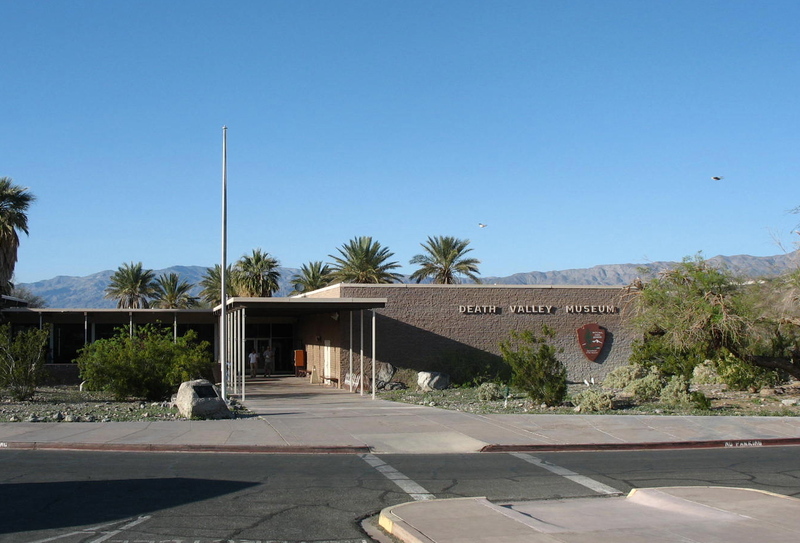 Cell phone service, at least at the main commercial centers of Furnace Creek and Stovepipe Wells, will start soon, along with all the intrusive babble: so much for quiet. And the museum is next. 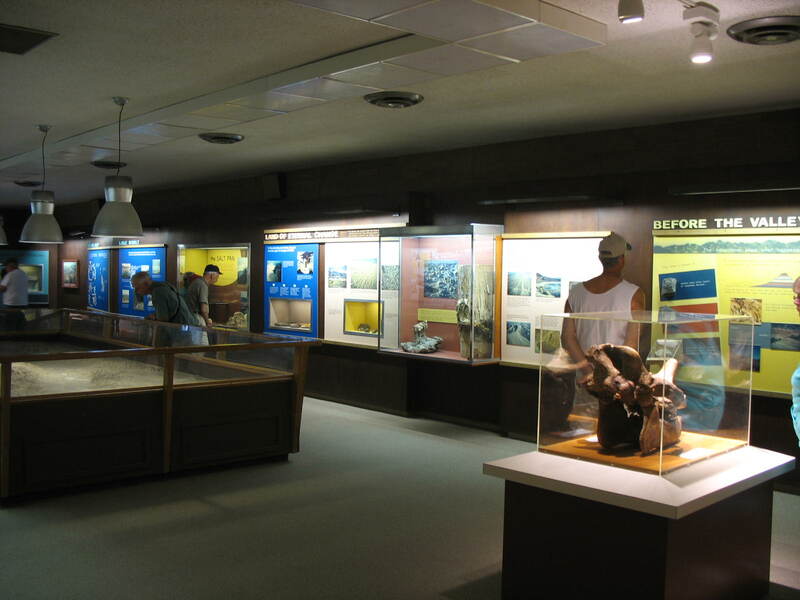 According to the latest Death Valley Visitor Guide, stimulus funds have been set aside to upgrade the museum exhibits. My fear is that audio and video will come crashing in — and to what purpose, really? 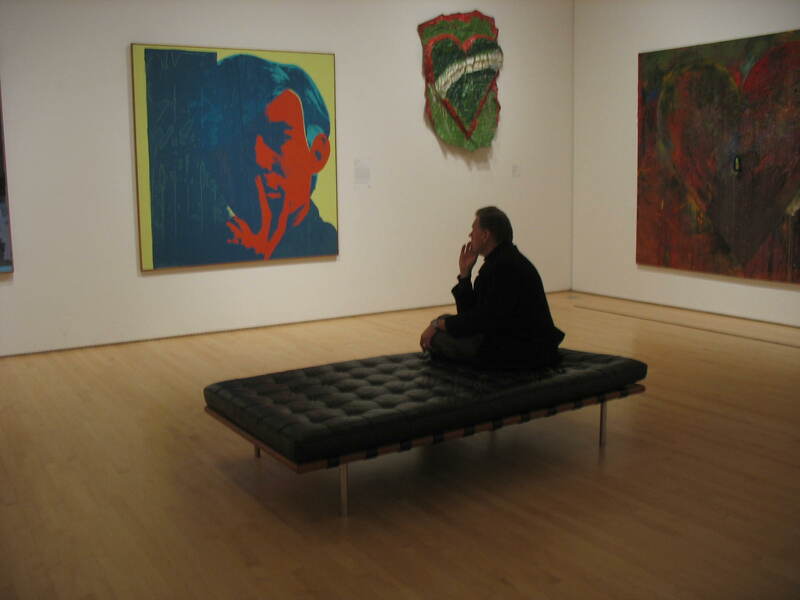 There are subtle ways to make the current exhibits more accessible to a wider variety of visitors, but the likelihood is that they will instead be replaced with cookie-cutter, characterless interactives, turned up too loud. I hope I’m wrong. Besides being beautiful in itself, it’s an example of an art that is no longer much practiced — which is a loss to us all. 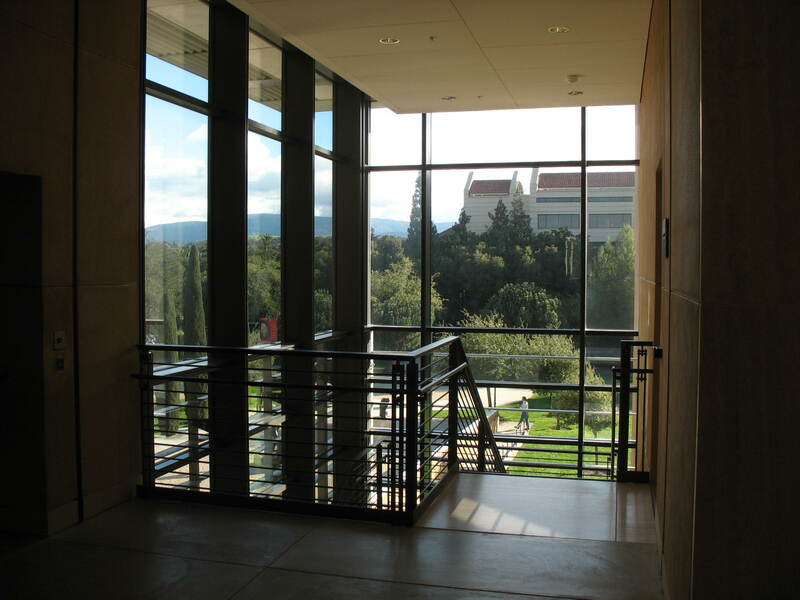 The Cantor Arts Center at Stanford University is filled with light and a sense of space that is apparent from the moment you enter the main lobby. 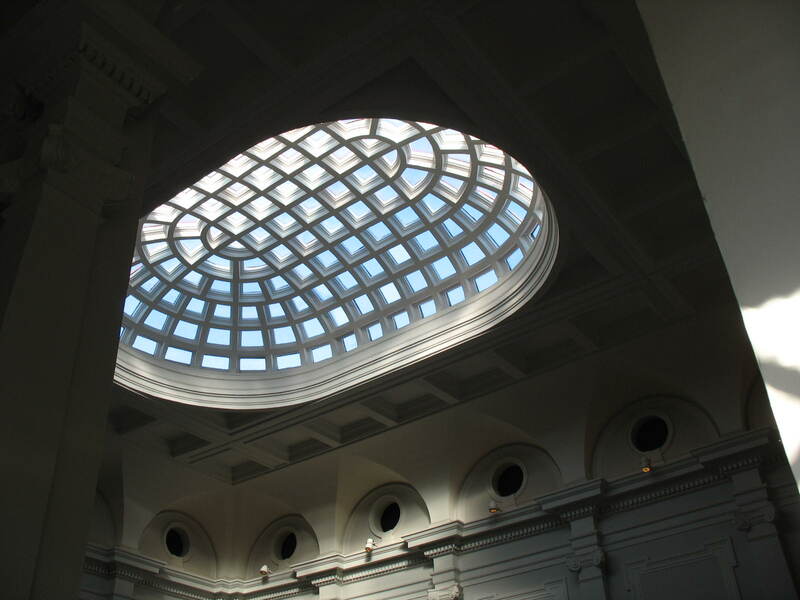 The original late-19th century building features skylights that bring in direct natural illumination without washing out or upstaging the art. . 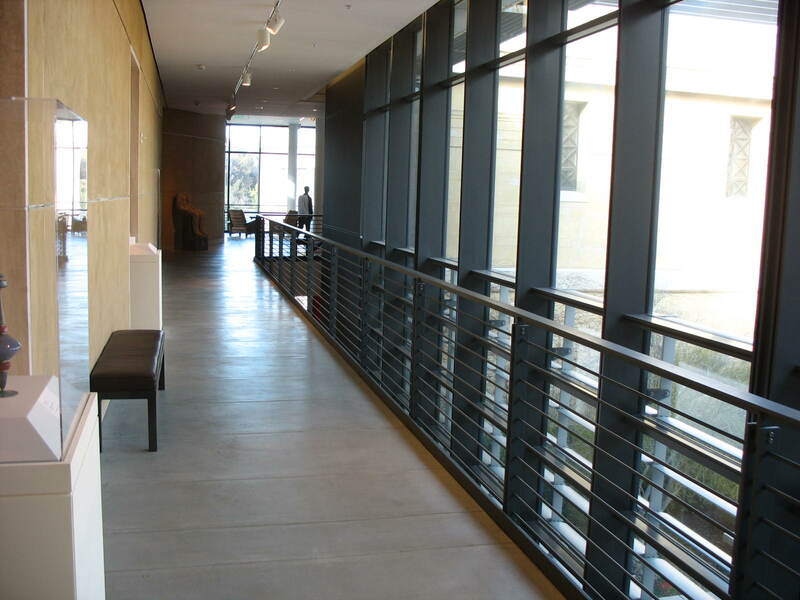 The late-20th century addition features a long, light-filled corridor that looks out over an interior courtyard. There’s a corridor right above it on the second floor as well. 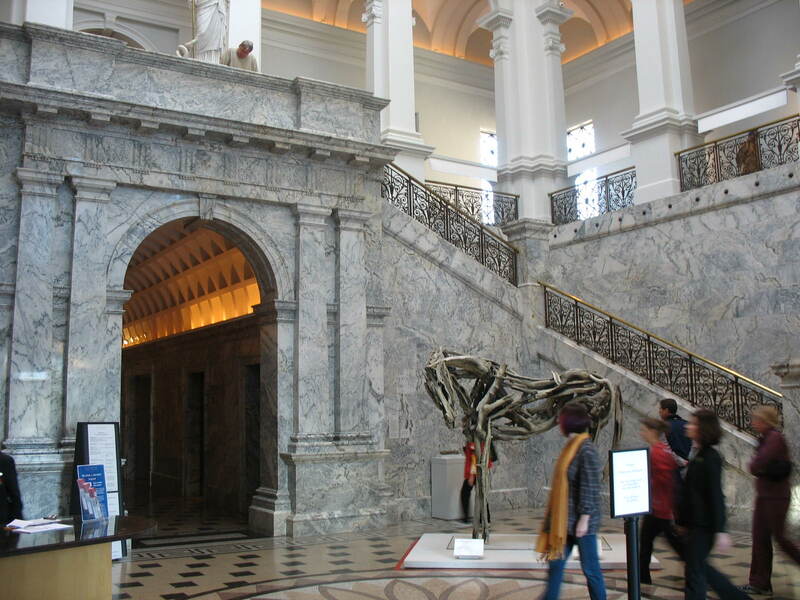 Both corridors have places to sit and look out into the courtyard: wonderful relief for the eye and spirit. 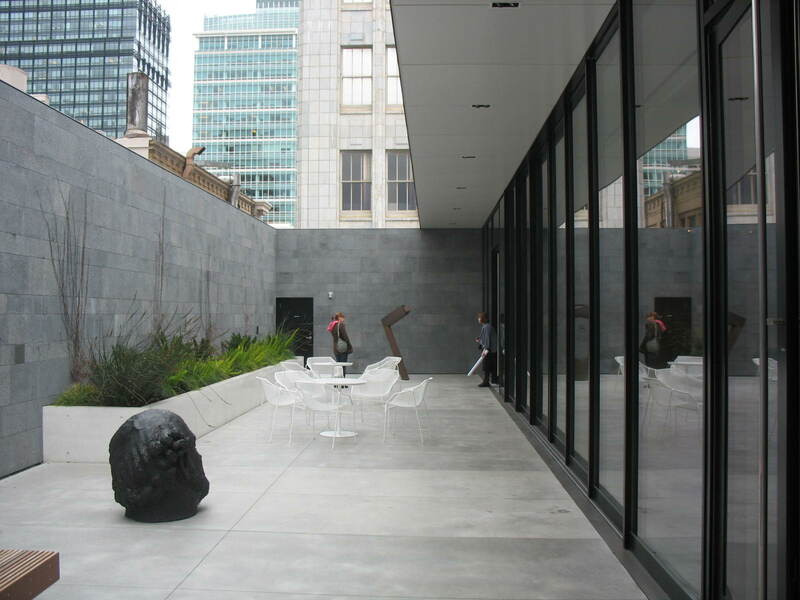 The second floor features an outdoor sculpture terrace. 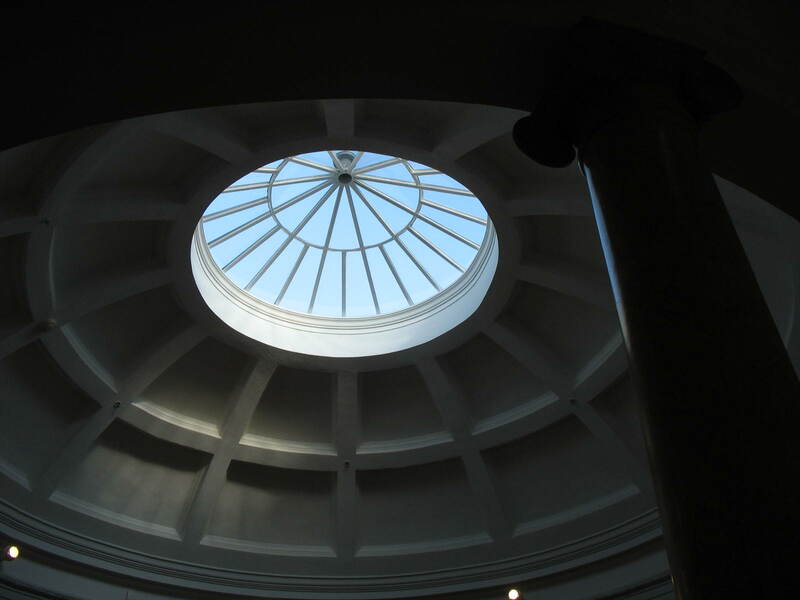 Altogether, the Cantor is extremely successful in bringing the outside inside, and thus providing the mental and spiritual refreshment that is such an important component of comfort in public spaces. 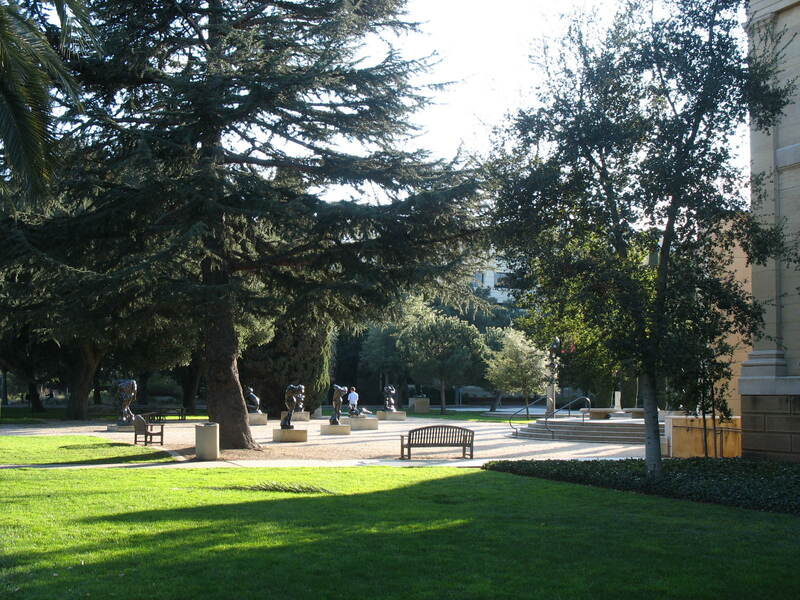 And places to hang out outside in the abundant Palo Alto sun. 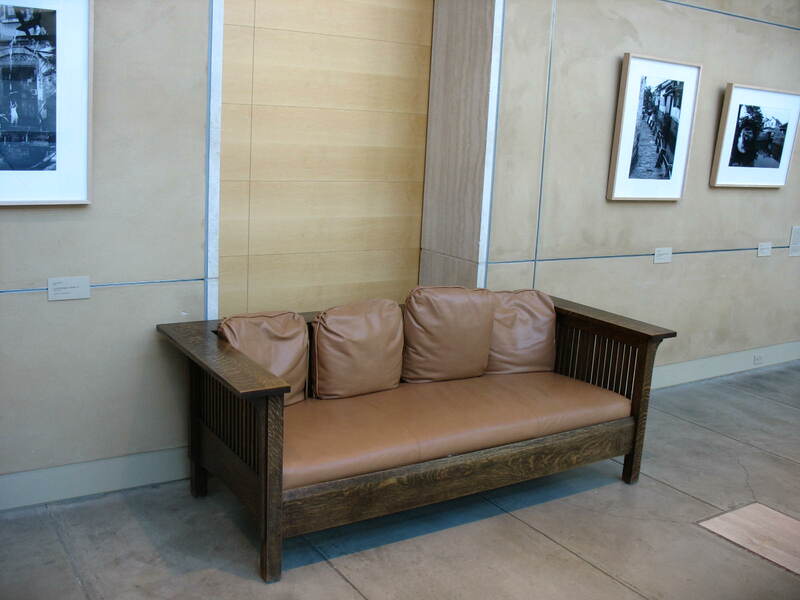 Altogether a most comfortable, welcoming space. Next up: Cantor Center’s use of light and space. 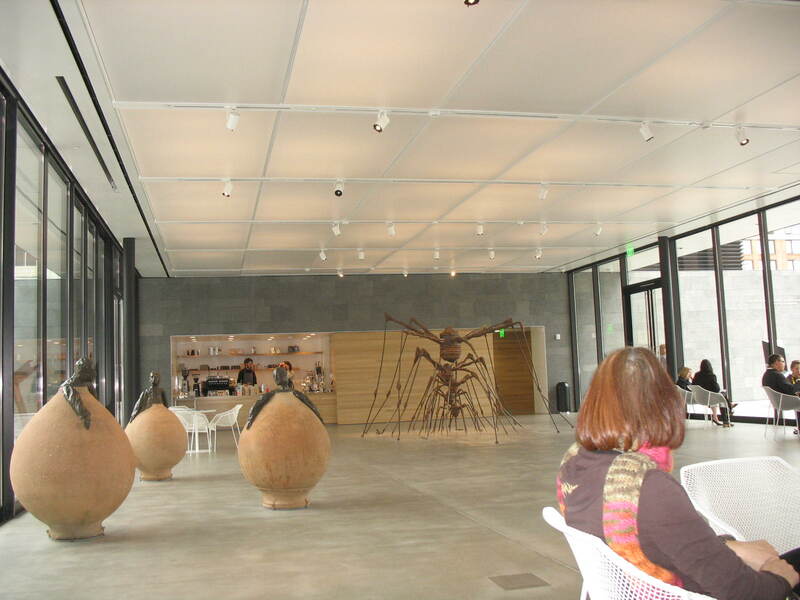 The recently opened top-floor cafe at SFMOMA is pretty successful as a place to rest and refresh, if somewhat pricey in the coffee and snacks department. There aren’t really enough tables to accommodate everyone during periods of heavy use, but there’s an advantage to that. On two occasions, we’ve shared tables with strangers and gotten into interesting conversations as a result. So in a way the dearth of tables encourages social interaction. 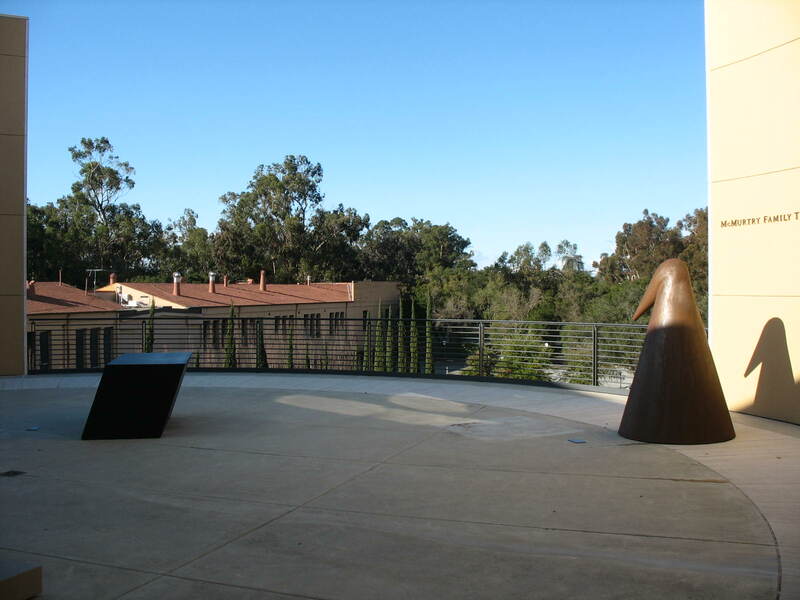 The adjacent sculpture garden (to the south or right in the above photo) is a pleasant enough space. To the north (or left) is another outside area that, while it features sculpture, is often too sunless, windy, and chilly to be enjoyed sitting down. 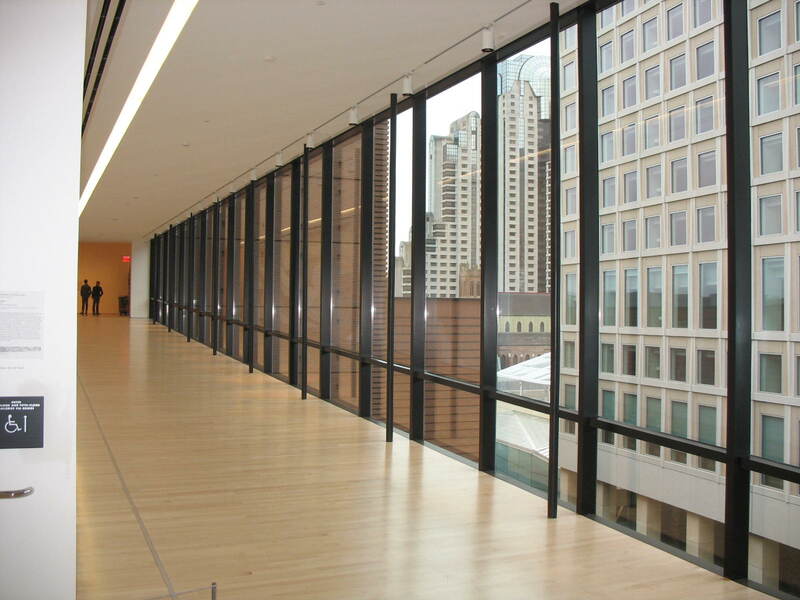 To get to and from the cafe, you pass through a corridor with a long glass wall that looks out over the urban jumble north of the museum toward Mission Street. 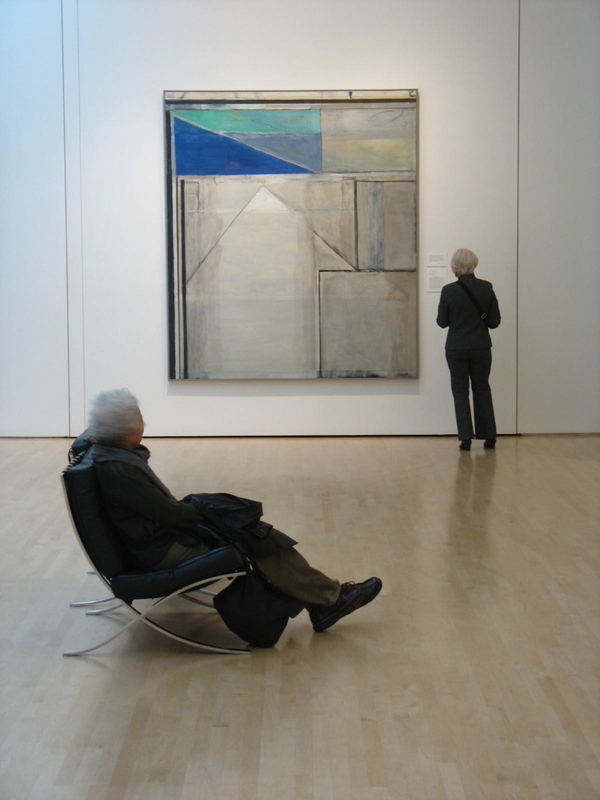 This is another space that works well in terms of eye and spirit relief. 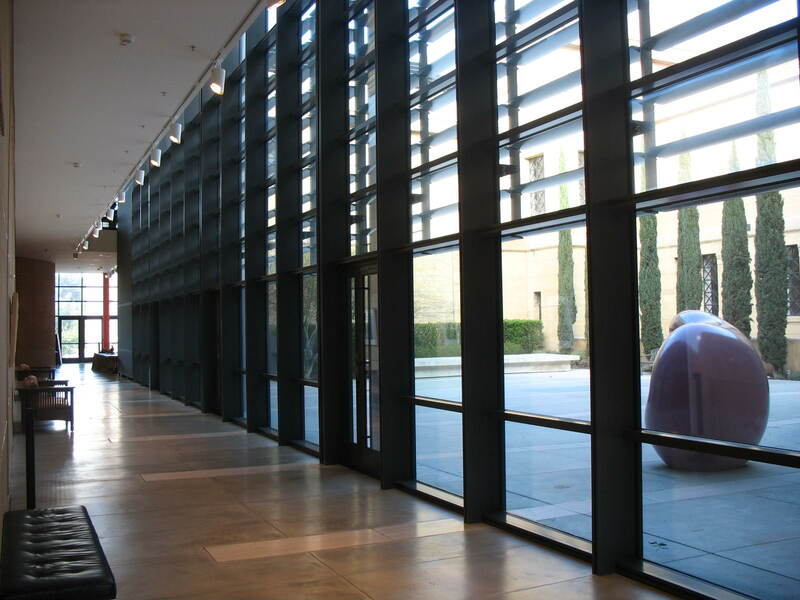 The full length windows bring the outside right into the museum, and the flood of natural light is a relief after the white-cube windowless top floor galleries. 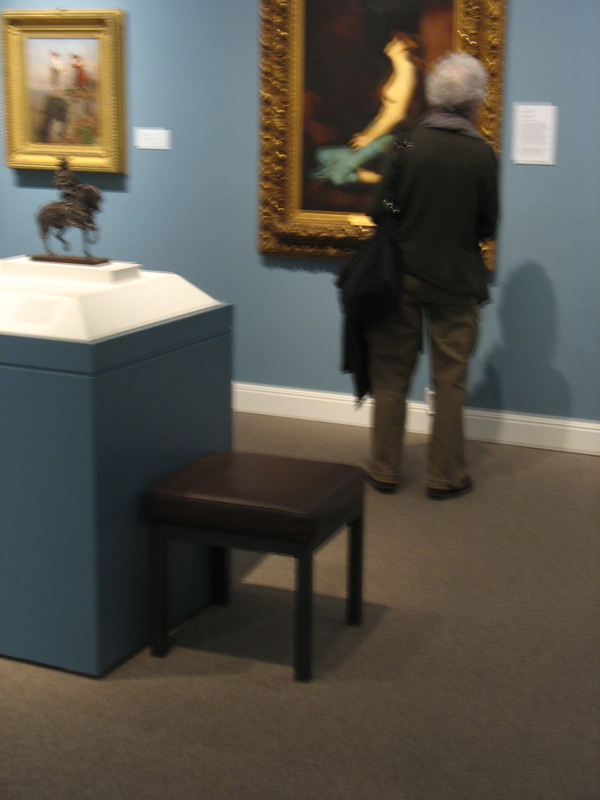 Speaking of galleries, there is ample (if backless and armless) seating throughout the museum, placed to encourage contemplation of the art. Labels are decently readable, for the most part. I didn’t notice this one (toward the right in the photo below) until I went through my images from the visit – it’s a lot of text, but it’s in big, legible type. 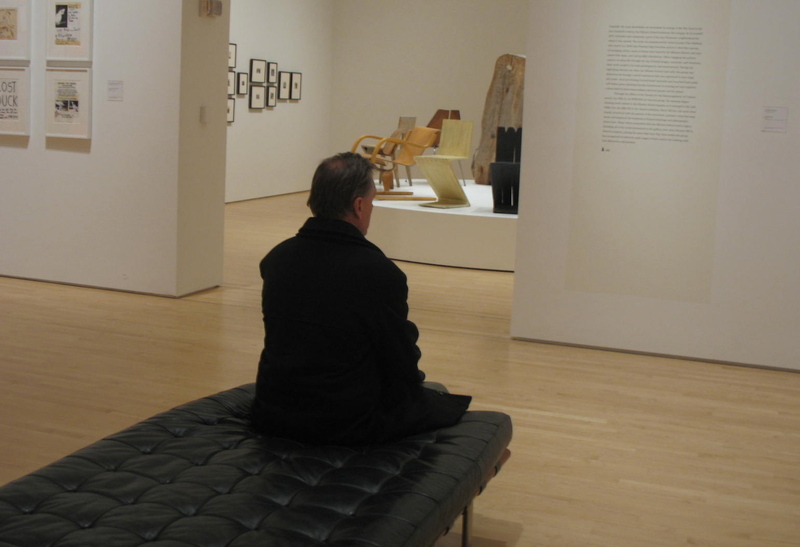 I was also pleased to note that SFMOMA’s Koret Education Center still is one of the best, most comfortable places to sit, space out, read, or watch a video that I’ve encountered in any museum. Quite a variety of chairs, couches, and stools. 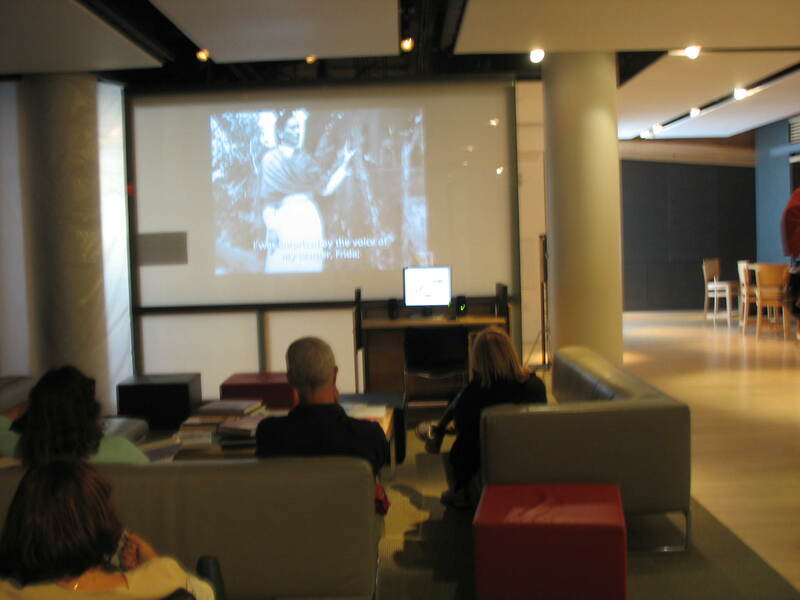 You can watch whatever video is currently playing, if you choose, or sit well out of the line of sight and sound if that’s your preference. 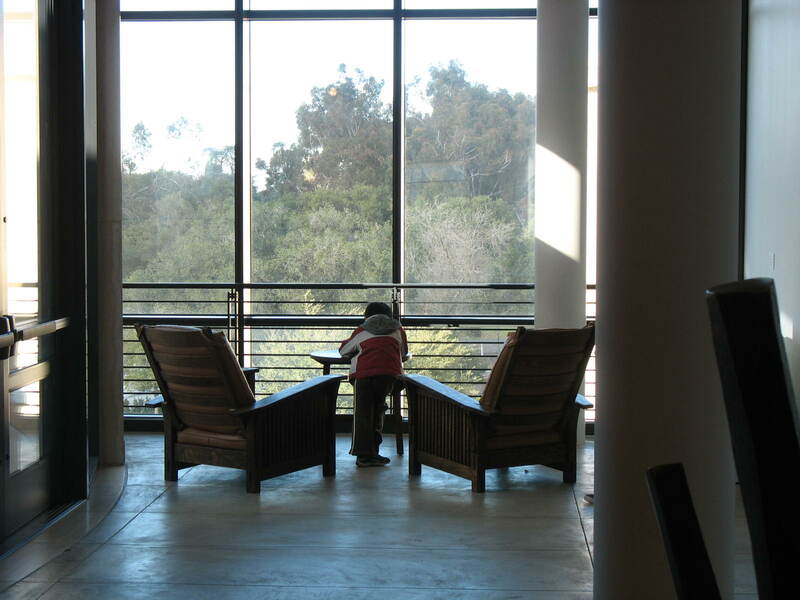 You are currently browsing the Please Be Seated blog archives for March, 2010.